Profits from each Dreamscape Coffee Thermos fund our charitable efforts and help us grow. Wake up in the morning with Dreamscape’s coffee thermos! Now you can drink coffee and support charity, at the same time. The mug features a rubber-lined grip, spill-resistant seal, a drink lid that locks for carefree travel and will stay cool to the touch of hot liquids. 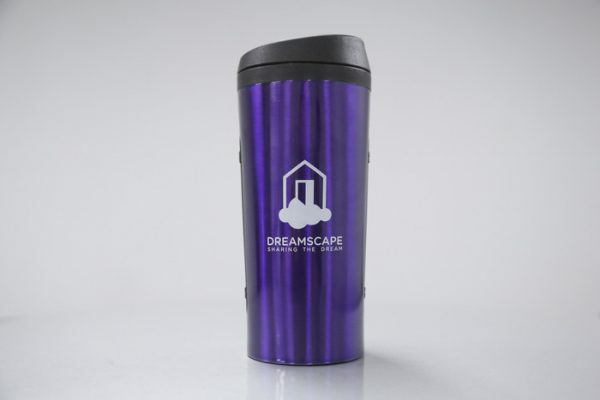 The thermos comes in Dreamscape’s signature colors, blue and purple. So, pick your favorite hot drink, and purchase our thermos to support disabilities.